Family Description: Herbs, rarely shrubs. Leaves alternate; lamina usually large and much-divided; petiole often inflated and sheathing at base. Stipules absent, except in Subfam. Hydrocotyloideae. Inflorescence usually a compound umbel. Flowers epigynous, small, hermaphrodite or unisexual, the plant rarely dioecious. Sepals usually small or absent; petals 5, usually more or less 3-lobed, the middle lobe inflexed; outer petals sometimes much larger than inner (radiate); stamens 5; carpels (1-)2, usually attached to a central axis (carpophore), from which the mericarps separate at maturity; styles (1-)2, often with a thickened base (stylopodium); ovule 1 in each loculus, pendent. Fruit dry; pericarp membranous or exocarp variously indurated; endocarp rarely woody (Subfam. Hydrocotyloideae). Mericarps usually joined by a narrow or wide commissure; each mericarp more or less compressed laterally or dorsally, with 5 longitudinal veins, usually with ridges over them, separated by valleculae or sometimes with 4 secondary ridges alternating with the primary; resin canals (vittae) usually present between the primary ridges and on the commissural face. Family Description: Shrubs or woody climbers; leaves alternate. Flowers actinomorphic, small. Calyx small or rudimentary; petals 5, free; stamens 5; ovary inferior. Fruit a berry. ( Cynomoriaceae Family ) Subfamalies: nil. Family Description: Herbs without chlorophyll, parasitic on the roots of other plants. Flowers usually unisexual, in dense, spicate or capitate inflorescences. Fruit a small, 1-seeded nut; seed with abundant endosperm and minute embryo. ( Oleaster Family ) Subfamalies: nil. Family Description: Trees or shrubs with peltate or stellate, scale-like hairs. Leaves entire. Flowers perigynous, apetalous. Hypanthium 2- or 4-lobed; lobes valvate; stamens as many as sepals and alternating with them, or twice as many; ovary superior, unilocular; ovule solitary, basal. Fruit drupe-like, the dry fruit being surrounded by the fleshy hypanthium. ( Milkwort Family ) Subfamalies: nil. Family Description: Leaves simple, exstipulate. Flowers hermaphrodite, zygomorphic, in spikes or racemes. Sepals 5, free; petals 3-5, more or less united; stamens 8, with filaments partly united. Ovary 2-locular, with 1 seed in each loculus. ( Buckthorn Family ) Subfamalies: nil. Family Description: Trees or shrubs. Leaves simple, usually stipulate. Inflorescence cymose. Flowers perigynous. Calyx 4- to 5-lobed, lobes valvate in bud. Petals 4-5, often small and sometimes absent, inserted at mouth of the hypanthium and often hooded over the stamens. Stamens 4-5, alternating with the calyx-lobes; anthers versatile. Ovary superior, 2- to 4-locular; ovules solitary. Fruit often fleshy. ( Sandalwood Family ) Subfamalies: nil. Family Description: Herbaceous or woody plants. Leaves alternate, simple, linear, oblong or lanceolate, exstipulate, deciduous or evergreen. Flowers small, hermaphrodite or unisexual. Perianth 3- to 5-lobed or -partite, tubular to campanulate-rotate. Stamens 3-5, opposite lobes of the perianth. Ovary inferior, 1-celled. Style 1; stigma capitate or lobed. Fruit a small green nut or a drupe. Seed solitary, with abundant endosperm. Hemiparasites, growing on the roots of herbs or shrubs. ( Vine Family ) Subfamalies: nil. Family Description: Shrubs, usually diffuse and climbing by means of leaf-opposed tendrils. Leaves alternate, stipulate, usually palmately lobed or divided. Flowers small, actinomorphic, in terminal or leaf opposed cymes or panicles. Sepals 5, united; petals 5, free or united distally; stamens 5, antepetalous. 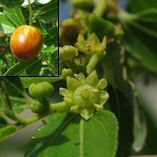 Ovary superior,2-locular; style and stigma 1; fruit a berry with 2-4 seeds.